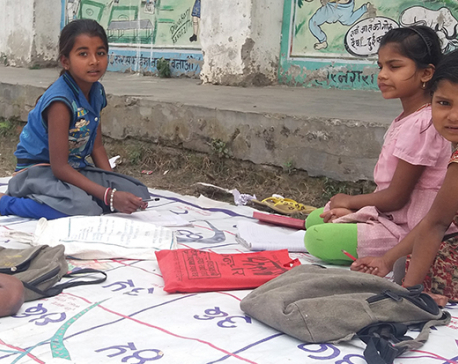 ROLPA, JULY 24: Twelve years old Sanjita Ghotane who lives in Rolpa's headquarters Libang, nearby the District Education Office, is deprived of education. She studied till Grade five at Bal Mandir Primary School and later joined Bal Kalyan Secondary School for Grade six but unfortunately she had to drop her studies in the middle. “I don't have a birth certificate but I somehow managed to register my name. I had to complete my household chores before leaving for the school. So, I would always be late for school,” Sanjita said, adding, “In Grade six, I went to school for 22 days but I could never attend the first period because of which I had to miss the attendance call.” Sometimes, teachers didn't allow her to enter the class for being late. “I thought they removed my name from the students' list. So, I stopped going to school,” she said. Seven years ago, Sanjita's mother handed her to her maternal grandparents and never returned. It has been so many years that she has not seen her father because of which she hardly remembers his face. 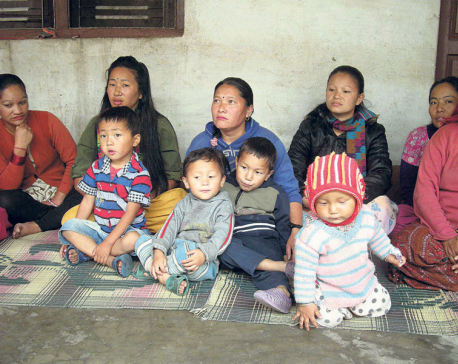 Her grandfather Durgashi Budha and her grandmother Jansari Budha, of Rolpa Municipality-10, Dhawang, were displaced during the Maoist insurgency. Since then, they have been working as laborers in the district headquarters to make ends meet. They are somehow managing their lives in a rented room. Sanjita who doesn't even know the names of her parents does cooking, washing, sweeping and other household works. “She does all the household works as we have to go for labor,” said her grandmother Jansari. It seems life has snatched away her childhood. “All of my friends go to school. If my parents were with me, maybe, I could also go to school with them,” Sanjita said. She has a 12 years old brother Ramesh, who, too, has left his school for earning money for the family. “We told him not to quit school but he didn't listen to us and now he works in the market,” Jansari laments. These two are just the representatives of many such cases of Rolpa. There is no record of the hundreds of children who quit school for working in brick factories and other industries. No one has taken any initiative to help these children return to schools. Though 'Save the Children' has been finding out such children and sending them back to school, still around 2,000 children are out of schools. Madhusudan Pokharel, principal of Bal Kalyan Secondary School, says that the school has not removed Sanjita's name and she has already been admitted despite not having a birth certificate. “We can't deprive a child from his/her right to education,” he said. The lack of child-friendly classrooms, carelessness of parents, negligence of teachers and schools are some of the reasons behind the decreasing level of education in Rolpa. Last year, more than 50 percent of schools in Rolpa had not completed their course even by the end of the academic year. Students were obliged to appear for the final exams without the completion of their courses. This had posed a serious problem especially for the students appearing for the Secondary Education Examination (SEE).